MADISON – Eight years ago this week, Gov. Scott Walker introduced his landmark collective bargaining reform legislation that became known as Act 10. It was a truly remarkable moment for Wisconsin that put taxpayers back in charge of their government and has proven to be the gift that keeps on giving, reducing the cost of government and saving taxpayers more than $5 billion. Walker and the Republican-controlled Legislature could have spent that money on more government, but instead they chose to return it to the people who earned it – the hard-working taxpayers of Wisconsin. Over the past eight years, the Legislature has passed and Walker has signed more than $8 billion in cumulative tax relief. The gift that keeps on giving, indeed. Wisconsin voters by a narrow margin decided to change course last November by replacing Walker with Democrat challenger Tony Evers. But Act 10 remains in place. The question is, will Evers try to repeal Act 10 in the future? Before the election he said he would “absolutely” try to repeal the law and, with it, all those savings and taxpayer protections. In the shorter term, facing divided government in the form of a Republican-controlled Legislature, will he try to chip away at it, using his powerful administrative pen to subvert what is perhaps the most significant pro-taxpayer reform in Wisconsin history? As taxpayers ask those questions, we take a look back at some of the most important Act 10 stories over the past eight years. Wisconsin liberals were furious with Walker’s attempt to curtail union power, and they showed up in droves – and in buses from out of state – to register their disapproval. Protesters flooded the Capitol. More than a week into the riots over Act 10, protesters still hadn’t left. In fact, they had set up camp inside the state Capitol and formed their own self-contained society and government. Public education was crippled and schools shut down as teachers skipped class and threatened to go on strike at the protests’ peak. Teachers admitted on camera that they were doing it for themselves at the expense of their students. As more people began to see what was really going on at the Capitol, public support for the occupiers eroded. When Act 10 passed, the occupation ended, but the protests continued for the next year and a half. The union movement was dealt a death blow in the summer of 2012 when Walker became the first governor in U.S. history to survive a recall election. Some people, however, couldn’t accept it was all over. Here is a classic MacIver video of one protester’s reaction. Despite all the turmoil, the steadfastness of Walker and legislators paid off for Wisconsin taxpayers. Watch our complete video coverage in chronological order here. To say that the landscape for public sector health insurance has changed since Act 10 would be an understatement. 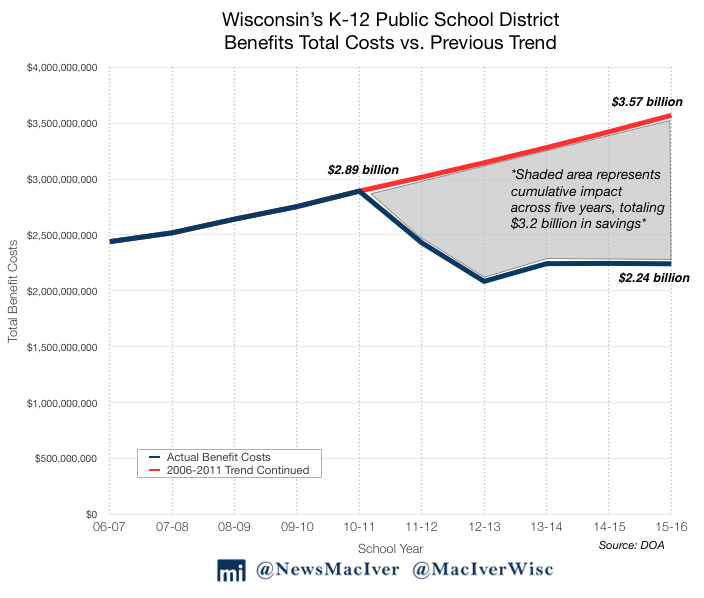 Since the bill’s enactment, Wisconsin school districts have saved more than $3.2 billion in benefits costs. Freed from the monopoly of the teachers’ union health insurance plan, districts found savings by opening up bidding to new insurers for the first time in years, while others increased required employee contributions towards insurance plans. Overall, since 2011, districts have largely moved to more taxpayer-friendly health plans – freeing up more money for the classroom. Act 10 is truly the gift that keeps on giving. The $3.2 billion in benefits cost savings represented costs 60 percent lower than if the trend before Act 10 had continued. Thanks to Act 10, the market for government health care in Wisconsin has radically changed as school districts have been free to shop around and innovate. Not only have public school districts in Wisconsin saved $3.2 billion on benefits costs alone since 2011, but they’re innovating to save money while offering quality plans – just like the private sector has been forced to do. The majority of school districts found taxpayer savings by raising the required monthly premium contributions for employees. Many districts opened up bidding to new insurers for the first time in years, utilizing the competition of market forces that had long been closed off because of collective bargaining. In the 2010-11 school year, on average, districts paid upwards of 95 percent of employees’ premiums, totaling thousands of dollars per employee every month. That figure alone trended upwards in an unsustainable direction, crowding out other spending. New data from the 2017-18 school year show that school districts have taken advantage of the tools given to them by Act 10, providing more customizable, localized plans to the benefit of both employees and taxpayers. Act 10 gave teachers and other government employees the ability to choose whether or not to join a union. Many have voted with their feet, and Wisconsin’s largest teachers’ union for year after year has been a national leader in membership losses. The trend is even more stark when compared with the union’s pre-Act 10 heyday. Before the passage of the landmark collective bargaining reform law that delivered worker freedom to public employees, WEAC had 98,000 members. That means its member rolls have declined by 67 percent since 2011. In just the last year, WEAC’s membership drop was 4.9 percent, continuing a trend of educators choosing to walk away from the union. In 2011, Walker and the Republican Legislature started their odyssey that resulted in the signing of Act 10. Within five years the law had saved Wisconsin taxpayers $5.24 billion, according to a 2016 analysis by the MacIver Institute. The analysis found that Wisconsin saved $3.36 billion by requiring government employees contribute a reasonable amount to their own retirement. The analysis also estimates local units of governments saved an additional $404.8 million total by taking common sense steps like opening their employees’ health insurance to competitive bidding. Milwaukee Public Schools saved $1.3 billion in long-term pension liabilities, and Neenah saved $97 million in long-term pension liabilities in addition to other savings. These taxpayer savings are only possible thanks to Act 10 – and since our study, those savings have only continued to grow. Act 10 is still working. Hopefully, the new governor will consider its myriad positive impacts before he acts to diminish it.